Raaga.com: Trouble times for Ranbir Kapoor? Trouble times for Ranbir Kapoor? It seems trouble times are not ending for Ranbir Kapoor. 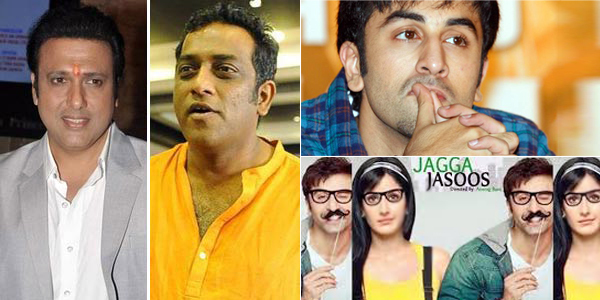 After the epic debacle of BOMBAY VELVET there are reports that Ranbir Kapoor’s next film JAGGA JASOOS is in trouble. It may be noted the film is in the news since many years. It was supposed to be released in October–November 2014 but due to umpteen hurdles the date was postponed to 27 November, 2015 but the makers failed to complete and were forced to again shift the date to 3 June, 2016. However according to latest development the release date may be postponed further!! Insider’s claim the movie which was almost 60 percent complete and was even touted to be released on 3 June, 2016 has again landed in deep crises. According to reports Govinda, who was playing the role of Ranbir Kapoor’s foster father has walked off the film, reportedly dejected by the film’s progress and his half baked role. However sources from the film claim there were some indifference between Govinda and filmmaker Anurag Basu that led to the fall out. Whatever be the case the film is back to zero as Govinda had shot many keys scenes and those scenes will have to be re-shot and this will delay the film. However reshooting of the scenes is not the real reason to worry. The reason that has put the film in soup is that none of the top actors are willing to play Ranbir Kapoor’s foster father’s role. Though filmmaker Anurag Basu has talks with senior actors like Anil Kapoor and Amitabh Bachchan but nobody has confirmed and it seems Anurag will have to rely back on Rishi Kapoor for the role. Will Anurag Basu take the risk of signing Rishi Kapoor because the father son Jodi had gone for a toss in BESHARAM (2013)! Let’s wait and see! !